Three years after its premiere, Lin-Manuel Miranda’s Hamilton is still running and is currently on its second national tour. 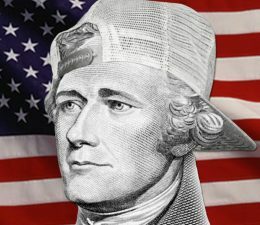 The hip-hop, racially diverse reimagining of the life of Alexander Hamilton has been the object of nauseatingly fulsome praise since its premiere and has been zealously promoted by the mainstream media. Hamilton songs have even become part of high school and college curricula nationwide. Its pro-immigrant message obscures the fact that Hamilton’s stance on immigration would be characterized as “xenophobic” today. Hamilton was instrumental in passing the Alien and Sedition Acts. The Alien Friends Act authorized the government to detain and deport foreigners hailing from an enemy nation during wartime, and the Alien Enemies Act authorized the president to imprison or deport foreigners who were suspected of posing a threat to the country during either wartime or peacetime. Hamilton’s support for the acts was not motivated by reluctant political pragmatism (as Ron Chernow has argued); he was among the foremost proponents of their enforcement. John Adams even credited him with having devised them. It is worth noting that, although Hamilton and Jefferson were bitter rivals, both opposed unrestricted immigration. Hamilton described the views on immigration outlined in Jefferson’s Notes on the State of Virginia as “undoubtedly correct.” It is significant that they agreed on this issue given the multitude of differences between them. It was taken for granted that measures should be taken to preserve America’s national character; they merely disagreed on the details. Jefferson and the Democratic-Republicans opposed the Alien and Sedition Acts, but primarily on the grounds that they granted excessive power to the federal government and that the Sedition Act violated the right to free speech.
. . . The influx of foreigners must, therefore, tend to produce a heterogeneous compound; to change and corrupt the national spirit; to complicate and confound public opinion; to introduce foreign propensities. In the composition of society, the harmony of the ingredients is all important, and whatever tends to a discordant intermixture must have an injurious tendency. The impolicy of admitting foreigners to an immediate and unreserved participation in the right of suffrage, or in the sovereignty of a Republic, is as much a received axiom as any thing in the science of politics, and is verified by the experience of all ages. Among other instances, it is known, that hardly any thing contributed more to the downfall of Rome, than her precipitate communication of the privileges of citizenship to the inhabitants of Italy at large. And how terribly was Syracuse scourged by perpetual seditions, when, after the overthrow of the tyrants, a great number of foreigners were suddenly admitted to the rights of citizenship? Not only does ancient but modern, and even domestic history furnish evidence of what may be expected from the dispositions of foreigners, when they get too early footing in a country. Hamilton was also an unabashed elitist who opposed democracy. He went as far as to call democracy a “poison” in his last letter. He did not look well on the French Revolution. He was opposed to rebellions enacted by the “unthinking populace” and supported the idea of using military force to suppress them if necessary. Hamilton’s protectionism is likewise anathema to today’s neoliberal establishment. He supported instituting tariffs on imports in order to encourage American industry and reduce reliance on foreign products. He was the intellectual father of the American School of Economics, which came into being in the 1860s and was characterized by support for homegrown manufacturing and opposition to free trade. Trump’s “America First” platform resembles this tradition. Hamilton opposed slavery and belonged to the New York Manumission Society, but he owned slaves himself and participated in the exchange of slaves. His wife’s family were also slaveholders. His opposition to slavery was a minor aspect of his worldview, and he seldom commented on the subject. Miranda’s portrayal of him as a passionate abolitionist is wishful thinking. All of this is overlooked in the musical (and also downplayed in Ron Chernow’s biography, upon which the musical is loosely based). In general, it focuses more on the characters’ human ambitions and emotions than their respective political philosophies. As a work of art, Hamilton is vastly overrated. There are a handful of clever rhymes and well-placed references throughout, but the show overall resembles a two-and-a-half-hour-long glorified high school history skit. Michelle Obama called it “the best piece of art in any form that I have ever seen in my life,” which is all one needs to know. The Hamilton craze appears to be a bipartisan phenomenon. Its fans are mostly white liberals, though it is also admired by the neocon Boomers at the National Review, whose review of it is embarrassingly titled “Funky Founder.” 77% of people who attend Broadway shows are white, and 80% have a college education. They are affluent; the average ticket to Hamilton is about $800. (I did not see it live. I saw it on Pornhub.) It is unlikely that Hamilton audiences diverge from this norm. Hamilton has been trumpeted as the musical that “everyone” is seeing (the greatest cultural event of the decade, even), but hardly anyone has seen it outside of a coalition of government/media insiders, rich New Yorkers, and others in their social network. The total number of Hamilton viewers from January 2015 to March 2016 likely did not exceed 384,000. In comparison, the NASCAR Cup Series finale of 2015 was watched by 7.6 million Americans. Miranda is not a stranger to the milieu of Hamilton audiences. He does not have much in the way of “street cred,” despite his hip-hop pretensions. His father was an adviser to Ed Koch, his mother was a psychologist, and he attended Wesleyan University. He has spent most of his life around educated whites. The musical is popular among white liberals (and “funky” aging neocons) in large part because its pro-immigrant, anti-racist message enables them to signal their progressive bonafides and experience diversity vicariously from the comfort of the theatre without actually having to interact with non-whites in real life. They can listen to Miranda’s anodyne, polished brand of hip-hop and congratulate themselves on being cool without experiencing the “vibrancy” of hip-hop/ghetto culture firsthand. This perhaps offers cause for optimism: even deracinated urban whites have an subconscious aversion to racial integration. It also panders to their high-minded fantasy that inside every black person lies a silver-tongued statesman or scholar waiting to emerge. White liberals do not really interact with black people (beyond token cases), so this fantasy is plausible to them. White moderates need to realize that non-whites (blacks in particular) do not share their vision of a multiracial utopia in which the races live and work together in peace. Most do not want mere parity with whites, nor the opportunity to participate in and contribute to Western culture. They would rather overturn white society itself. Hamilton’s multiracial casting holds sentimental appeal for whites who idealistically envision non-whites as their equals, but non-whites have generally been less enthusiastic about the musical. A number of them have rightfully criticized its blindness to historical fact and its failure to acknowledge the fact that America was founded on “racism” and inequality. They would rather see a musical involving a hypothetical black uprising against the Founding Fathers than one in which the Founding Fathers were played by non-whites. It is fitting and unsurprising that liberal/neoconservative elites have salivated over it. Their “patriotism” is hollow and inauthentic, and their feel-good endorsement of diversity willfully ignores the dystopian reality of multiracialism and globalization. The same is true of Hamilton. Alexander Hamilton, “The Examination no. VIII,” New York Evening Post, January 12, 1802. Alexander Hamilton, “The Examination no. VII,” New York Evening Post, January 7, 1802. Alexander Hamilton to Theodore Sedgwick, July 10, 1804. Alexander Hamilton to John Jay, November 26, 1775.